Adapter Letter Naming Convention - What Do The Letters Mean? For a full list of adapters by country you can refer to Going In Style's Adapter Guide. 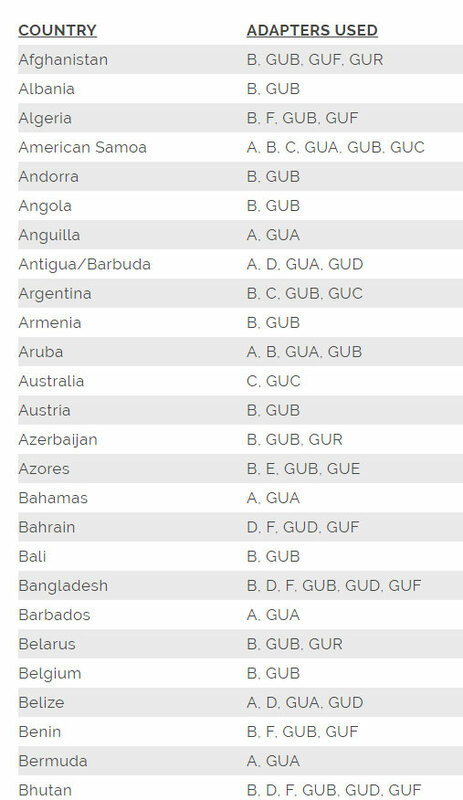 To make finding the correct adapter plug simple and easy for our customers, Going In Style has adapter plugs listed alphabetically by country. You can purchase travel adapters locally at our flagship travel store at Stanford Shopping Mall in Palo Alto, California. We carry adapter plugs for world wide travelers at Going In Style Travel Accessories, 609 Stanford Shopping Center, Palo Alto, CA 94304 - Visit the Stanford Travel Store website www.stanfordtravelstore.com for directions to Going In Style.